Like many others that didn’t live in a seaside resort, my experience of the golden age of video game arcades was limited to a week in the summer and when the fair came to town. 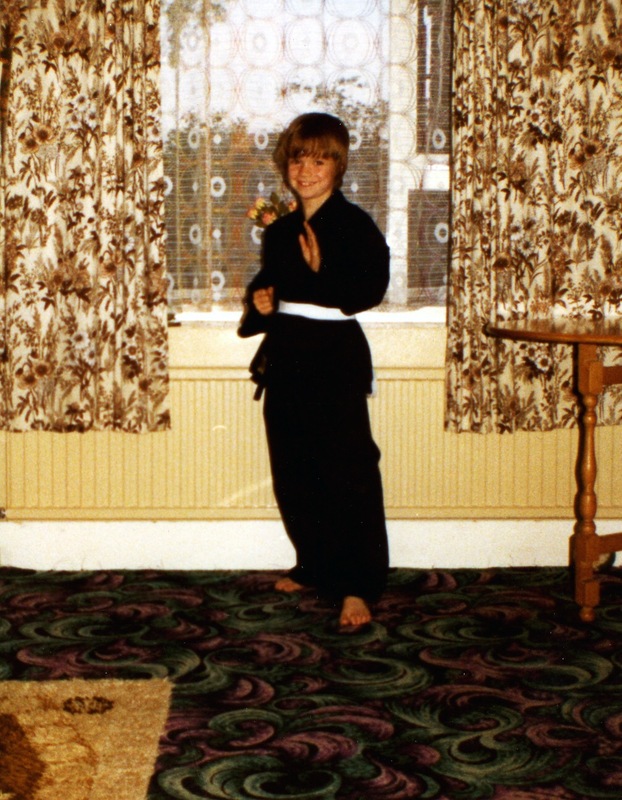 The closest we had was the Bunyan Centre – a big sports centre a few hundred metres from home where I’d spent a few years becoming something of a kung-fu master myself every Saturday lunchtime. My brother and me were there on Monday nights too for trampolining for a while; we’d have to leave for it just after Inspector Gadget. I think five-a-side football was Wednesday night. Probably after Danger Mouse. Then if you were lucky there was a roller disco once a month while that was the coolest thing in the world. And afternoon multi-sport sessions in school holidays, which is where another Kung-Fu Master comes in. These sessions were pretty much Lord of the Flies – kids running riot around the centre, whacking squash balls up through the fan at the top of the court, trying to clean and jerk the biggest thing you could find in the weight room and so on. And overlooking the main hall was a balcony area with a couple of vending machines (one of which was the only place in town to buy Dr Pepper) and three regularly rotated arcade machines. 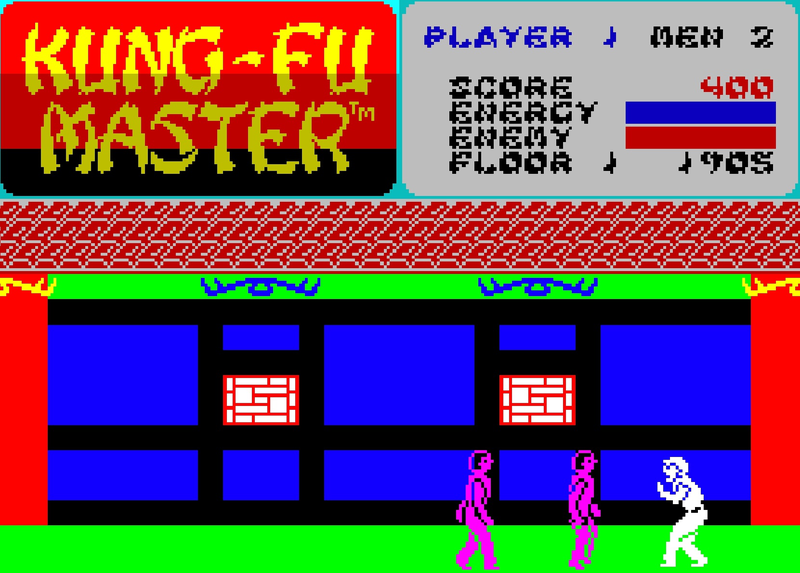 I reckon Kung-Fu Master appeared there around 1985. An iconic (and possibly the first) horizontally scrolling beat ’em up where you’re making your way against the clock and waves of goons to a boss by the stairs to the next of five floors. I remember watching older kids playing it and getting a few floors up, but this is one of those games I absolutely loved without being very good at it and never getting beyond the second floor. It’s not a visual feast, but it drips martial arts movie atmosphere, being very inspired by the Bruce Lee movie Game of Death. You’ve got a punch and kick button, then left, right, crouch and jump on the joystick; you could also waggle it to free yourself from an enemy grip. You got more points for punching than kicking, but a jump kick was worth more. And the number of points depended on the type of enemy, whether regular thugs, tougher ones, knife throwers or oddball “bonus” enemies like moths and vases! Then you had the bosses for more points – I can only really talk about the one with sticks on the first floor and not getting beyond the one with boomerangs on the next, but they get more exotic with a giant, a black magician and Mr X. I think generally if you could back the first ones up to the stairs you just had to punch and kick a lot to beat them. This game soon got frantic with enemies ganging-up on both sides, but much like Ghosts n’ Goblins, the difficulty never made it frustrating to me to play. I was more than happy putting 10p after 10p in and spending a couple of minutes on the first floor, then watching the older kids get a bit further until it was my turn again. That was until the Spectrum version appeared in 1986! I’m generally the world’s most forgiving when it comes to arcade ports – to me every Out Run and Operation Wolf was arcade perfect because it was in my house and that was unbelievable at the time! But this one was truly a shocker that even my misplaced generosity couldn’t stretch to approval of. It’s a heartbreaking realisation when you’re twelve or thirteen to realise that the pocket money you’d been saving up to buy a game you thought you loved had been wasted. The graphics were terrible, the colour clash made worse by the use of bizarre colours, it didn’t scroll properly and no matter how fast you mashed the joystick button, the attacks just moved in their own time – which was about half the speed they needed to be to give you a chance in hell – and even if you landed one you were very lucky if the game realised it. I’d love to love this game on the Spectrum and I even played it again only yesterday to try and convince myself I’d got it wrong, but I’m afraid I hadn’t. 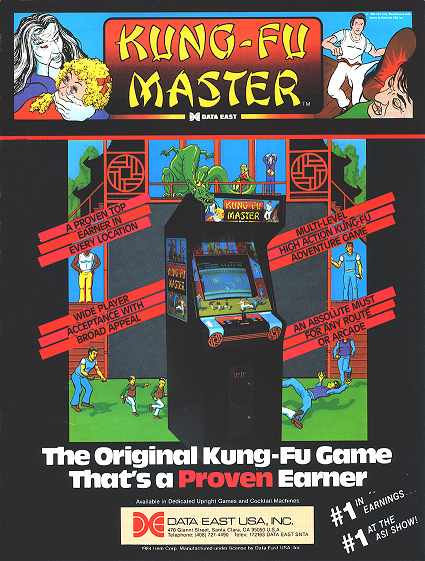 Until next time… but before I sign off, here’s that other kung-fu master I mentioned earlier, circa 1980!